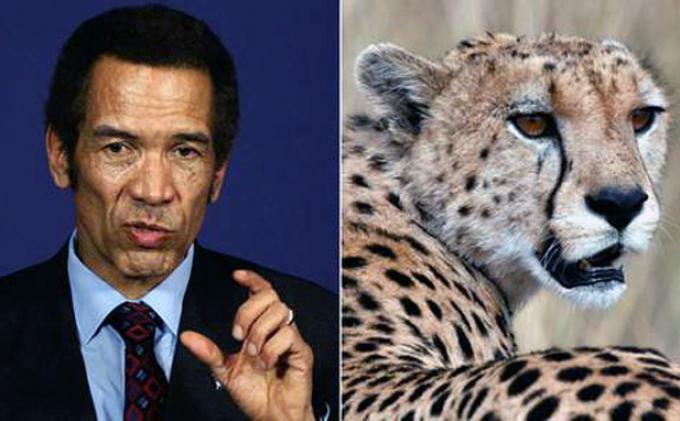 Botswana President Ian Khama needed stitches on his face after being scratched by a cheetah, officials say. The animal was reportedly being fed in its enclosure at an army barracks when it jumped up and scratched Ian Khama, who was standing nearby. The incident was “a freak accident, but not an attack”, government spokesman Jeff Ramsay told local media. Ian Khama’s injuries were minor and there were “no real security implications”, the official added. The incident is said to have happened very fast, catching the president and his bodyguard by surprise. “He was scratched by a cheetah but not really attacked per se,” said Jeff Ramsay. Ian Khama was seen sporting a plaster at a meeting following the attack. Cheetahs, the world’s fastest land mammals, are listed as an endangered species. Around 12,400 are thought to remain in the wild in African countries, including Botswana.